Now, you too can pray the psalms of King David, saying the very words he wrote, spoke and sang in Leshon Hakodesh (the Holy tongue) - Hebrew. While you listen to the words, whether to practice, meditate or to solemnly pray, you'll also hear the heavenly music of King David's harp. These melodies were played in Jerusalem on the original, very first reproduction in 2000 years of the biblical 22-string harp. 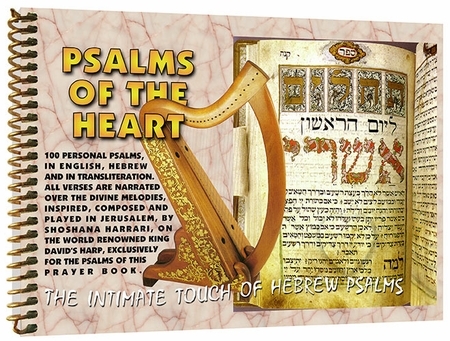 Psalms of the Heart Music-CD also includes selected verses accompanied by famous Psalm melodies, as they were sung for many generations, and beautiful psalm songs performed in Israel in the last 40 years.